Index Words: temperature, cold hardiness, container production, fabric pots, Iteavirginica, Physocarpus opulifolius, Viburnum trilobum, Weigela florida Significance to the Industry: Over-wintering container nursery stock in most parts of the country normally requires some type of root zone protection since the roots are less cold hardy than shoots (1, 2). This paper reports greater winter survival of unprotected plants in fabric containers compared to plastic containers, and looks at differences in media temperatures. The applicability and the economic benefit of this production method for reducing over-wintering costs and losses may be greater in zones 6-8 than in zone 5, due to fewer cold temperature extremes. Nature of Work: In comparison to standard black plastic nursery pots, aboveground fabric containers reduce maximum root zone temperatures through evaporative cooling and reduced absorption of solar radiation. Plants grown in fabric containers also have improved root structure as a result of air root pruning. Developed and used in southern areas, fabric containers also have advantages for northern nursery production. Container media temperatures on the sun side of plastic pots frequently reach the lethal range of 100-120º F even in northern production areas. Media temperatures in plastic containers recorded in Durham, N.H. (latitude 43.14N, longitude 70.93W) exceeded the 100º F threshold on 67 days between mid-May and mid-October, 2002 and on 75 days in 2004. The maximum temperature reached in fabric containers was 90ºF (3). In 2004, the manufacturer of SmartPots™ (High Caliper Growing System, Oklahoma City Ok.) encouraged me to leave well-established plants in no. 7 fabric containers out in the nursery, exposed to winter temperatures. I had no expectations that anything would live, but for comparison left equivalent plants in no. 7 plastic containers as well. There were four plants of each species – Itea virginica, Physocarpus opulifolius, Viburnum trilobum, and Weigela fl orida – in each pot type. Survival and growth was monitored in the spring and throughout the following growing season. Healthy plants were stepped up to no. 10 containers in August 2005 and over-wintered in place for the second winter, 2005-06. Hobo H8 Outdoor/Industrial 4-channel dataloggers (Onset Computer, Pohasset, Mass) were set up to record media temperatures in the south-southwest pot quadrant 1” from the pot wall, at 30 minute intervals from 24 June 2004 thru 11 April 2005 and from 9 Sept 2005 thru the end of the trial. There were occasional periods where a channel malfunctioned and left gaps in the data. Results and Discussion: The results were very surprising, given the very cold winter of 2004-05 with a minimum temperature of -18.5º F and 13 nights with sub-zero temperatures. There was, however, snow cover to provide root zone insulation during most of the season. Of the four species in the trial, one (Itea virginica) died regardless of container type. Two (Physocarpus opulifolius and Weigela fl orida) survived in both container types and recovered during the growing season, althoughPhysocarpus exhibited some branch dieback only in the plastic pots. Viburnum trilobum died in the plastic pots but in fabric pots not only survived but showed no signs of stress. The winter of 2005-06 was above-average in terms of temperature, with only two short periods of sub-zero temperatures, occurring in early December and late February. There was little or no snow cover most of the winter. At this time (late May, 2006), all of the plants are leafing out normally and appear to have survived, but when hot weather arrives and water demand increases, it will become evident whether they sustained root damage or death during the winter. The temperature records show large differences between plastic and fabric pots in maximum media temperatures, even in the winter months. Data from the second winter, 2005-06, are shown in Fig. 1. Mean and average minimum temperatures differed only by a few degrees for most of the winter, although there were a few periods when air temperatures fell below zero and fabric containers were as much as 10º F colder than plastic containers. These results raise many questions as to why roots in fabric versus plastic pots are better able to survive the winter and/or regenerate new roots faster in the spring. No such results have been reported in the scientific literature, although Gill observed plants surviving in fabric pots in Maryland after the winter of 2002-03 (4). Similar incidental observations of greater survival in above-ground fabric pots were noted during the 2003-04 winter in Tennessee (K. Reiger, personal communication). 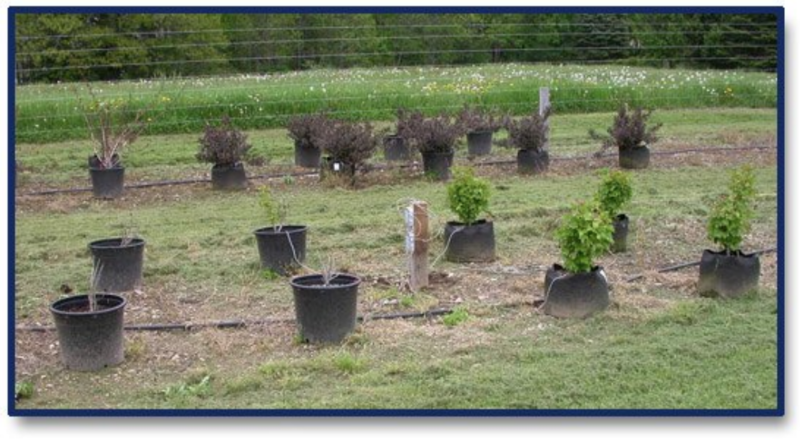 Further research is planned to explore the potential for over-wintering woody plants in above-ground fabric containers. 1. Havis, J.R. 1976. Root hardiness of woody ornamentals. HortScience 11:385-386. 2. Studer, E.J., P.L. Steponkus, G.L. Good and S.C. Wiest. 1978. Root hardiness of container-grown ornamentals. HortScience 13:172-174. 3. Neal, Catherine. 2003. 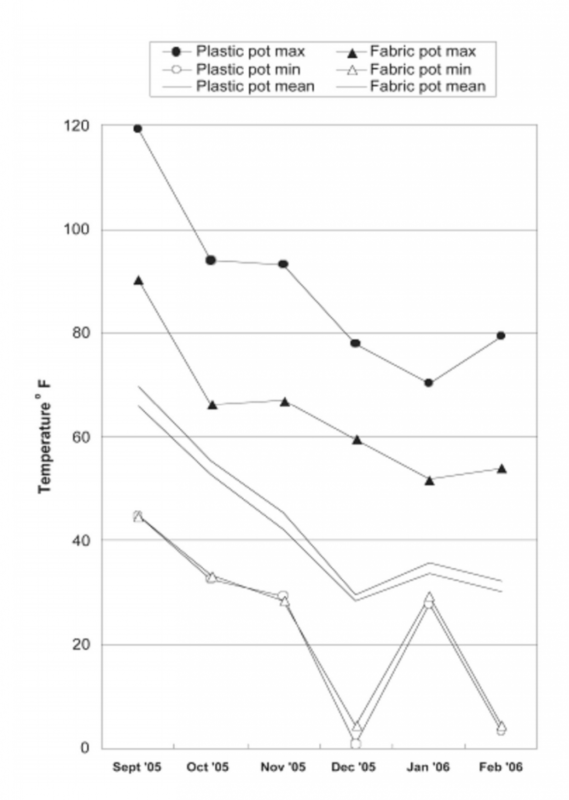 Crabapple growth and root zone temperatures in field, container, and pot-in-pot production systems. HortScience 38:701 (abstract).